This week’s pop culture news stories centered around two separate feuds between hip hop stars: on one end of the spectrum, Eminem versus Machine Gun Kelly; at the other end, Nicki Minaj versus Cardi B. Both fights involve an older, seasoned rapper attacking a younger, newer artist whom they feel threatened by. What is the difference between male versus male and female versus female rivalries, and why did one end in a shoe colliding with a forehead at the Harper’s Bazaar ICONS party? Rumors of bad blood between the two female rappers have been ongoing ever since Cardi first emerged on the hip hop scene. For years, Nicki has been the prevalent female rapper, and Cardi is the first woman to pose a real challenge to Minaj’s status. At 25 years old, she is ten years Nicki’s junior. The assumption that the two women were in competition was only fueled by alleged subtweets, disses on tracks, and tightlipped comments during interviews. When Nicki and Cardi were featured on the same Migos song, however, there seemed to be hope for reconciliation. This sentiment was quickly dashed when the music video for “Motorsport” was released, and the women appeared in entirely separate scenes, indicating that they did not film together. Nicki’s fans further claimed that Cardi stole Minaj’s style. 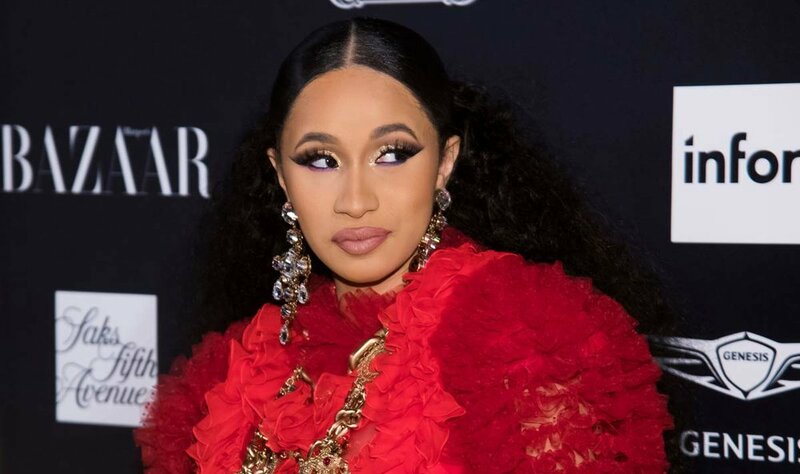 While Cardi claimed that scheduling conflicts led to their separate appearances, fans could not help but suspect the truth. But after September 7th, speculation gave way to a confirmation of what everyone had long suspected. All other New York Fashion Week discussion was quickly overshadowed by a single picture of Cardi B being escorted from the Harper’s Bazaar ICONS party barefoot, looking dignified in a ripped red Dolce and Gabbana gown, with a massive lump on her forehead. According to an eye witness, Cardi approached Nicki’s table to confront her about lies she has been spreading. She warned her not to speak about her newborn daughter, Kulture. Cardi was elbowed by a member of Nicki’s entourage, which included eight or nine bodyguards. When Cardi could not get through to Nicki, she threw her shoe and was immediately escorted from the venue. Nicki did not respond until Monday, when she said on her show Queen Radio, “The other night I was part of something so mortifying and so humiliating to go through in front of a bunch of upper echelon people who have their life together.” As far as rumors that the confrontation was in regards to Nicki allegedly liking tweets and comments criticizing Cardi as a mother, Minaj said, “I would never talk about anyone’s child or anyone’s parenting...And it’s so crazy to me that people always need to make Onika the bad guy.” This quote is in direct reference to her song “Chun Li”, which she dropped a week after Cardi released her chart-topping album Invasion of Privacy. Fan loyalty in this feud between two white male rappers tends to lie with Eminem, who has become a staple in the history of hip hop. Conversely, in the case of Nicki versus Cardi, favor falls with the newer face. It seems that fans are more prone to sympathizing with parents, especially ones like Em and Cardi whose children are vulnerable to the public eye by birth. Cardi has built up her image around authenticity and the empowerment of herself and her fellow women. She openly embraces her body, her past as a stripper, and shares her triumphs and failures willfully with her followers on Instagram. This shameless self-love and confidence in her road to stardom and ultimate success has made her surpass Nicki in popularity. While Nicki Minaj, whose persona is made up of alter egos, has been a maverick in the hip hop scene and was once considered the preeminent female rapper, Cardi’s emergence has disrupted Minaj’s trajectory. Critics have pointed out that she paved the way for artists like Cardi to succeed. Nicki’s image is centered around and this subhuman identification has been polarizing to fans. Her group of followers is known as the “Barbz”, and have been known to lash out on social media at anyone who disrespects their queen. Cardi and Nicki are constantly in neck and neck competition for top female rapper, but in the case of Eminem versus Machine Gun Kelly, Em is indisputably MGK’s superior, and clapping back at him simply served to gain both artists more plays. If anyone felt that Cardi B was undignified in attacking Nicki at a gala event, no one said it. Fans who support Cardi felt that NIcki had it coming, and deserved to be called out, regardless of the occasion. While she could have taken the Eminem route and released a fiery diss track, Cardi chose a more direct approach. Had Eminem and MGK’s feud gotten physical in this way, comparisons would have been drawn to Biggie and Tupac. That’s probably because the idea of prominent female rappers is still new and unchartered territory. Nicki Minaj and Cardi B may not like each other- they're each other’s biggest and only rivals. But the fact that they exist in an industry that has been predominantly male-centric since its inception is significant. Rap beef is inevitable and seems to be almost compulsory. Eminem and Machine Gun Kelly are from different eras and possess entirely separate styles. Cardi B and Nicki Minaj are two unique talents who operate in their own ways but work within the same creative sphere.